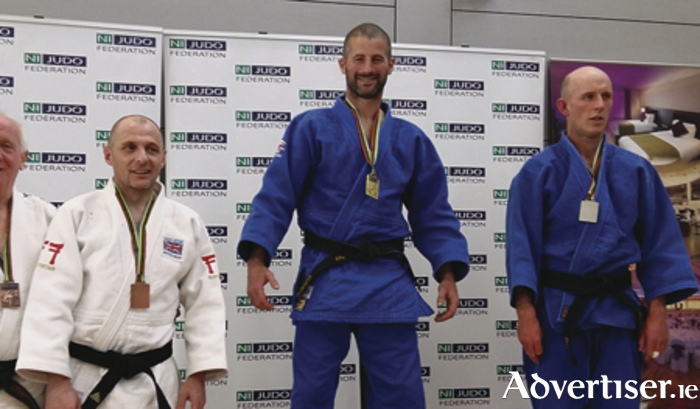 Oranmore’s Competitions Coach, Richard Murphy, took the Gold medal in the Northern Ireland Open 2016 Judo contest on April 9/10. He won all his fights by ippon(a perfect throw for a perfect score ), beating British Open Champion Robert Morrow (in picture on right ) to the top spot in Derry recently. That gives Richard a total of three Gold medals this season: in the Irish Open. the Irish Masters Open and now the Northern Ireland Open. Richard, from Clarinbridge, is the Oranmore Judo Club’s Seniors, and Competitions Coach. Judo means ‘the gentle – or flexible – way’. It is a sport and a martial art that is not about weight, nor strength, but about balance, skill, and attitude. Oranmore Judo Club welcomes new members of any level, age, or ability. The dojo, where the action takes place, is open to Juniors at Oranmore Community Centre from 6.30pm every Wednesday and Friday during the season and from 7.30 for Seniors.